NEW YORK (CNS) — Master Japanese director Hayao Miyazaki takes to the skies in what has been announced as his final animated film, “The Wind Rises” (Touchstone), a historical drama set in the turbulent years before World War II. Miyazaki, whose anime style is showcased in such films as “Spirited Away” (2001) and “Howl’s Moving Castle” (2004), wrote the screenplay for this more complex and grown-up picture — the subject matter and tone of which may offend some viewers. 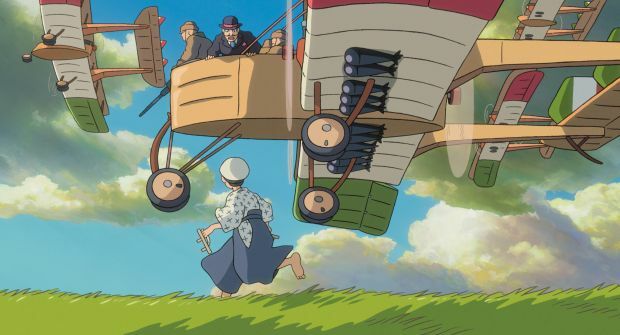 At once a fictionalized biography of the aeronautical engineer Jiro Horikoshi (1903-1982) and a history lesson, “The Wind Rises” seeks to put a human face on the rise of militarism in 1930s Japan. But the overall effect is a whitewash. Miyazaki prefers to honor creativity and technological achievements such as Jiro’s “Zero” fighter airplane, rather than dwell on the consequences: hundreds of thousands of lives lost, including those of the victims at Pearl Harbor. Throw in a weepy love story, and (period-accurate) cigarette smoking in nearly every scene, and what you’re left with is no ordinary cartoon. From a very young age, Jiro (voice of Joseph Gordon-Levitt) has been looking to the skies. In his dreams, he visits his hero, famed Italian airplane designer Giovanni Caproni (1886-1957), who becomes the inspiration for his life’s work. Caproni learned that lesson the hard way when his airplanes were used as bombers in World War I. Now Jiro’s bosses have the same idea. Jiro and his engineer friend Honjo (voice of John Krasinski) pack up and visit Japan’s ally, Nazi Germany, to learn from master aircraft designers there. Jiro isn’t necessarily torn between pacifism and militarism; he just wants to design the best and fastest aircraft in the world, which he does. Nor is he indecisive about his feelings for chance acquaintance-turned-love-interest Nahoko (voice of Emily Blunt), though their bond is tested by a series of disasters, both natural and man-made. “The Wind Rises” covers a lot of ground but moves at a leisurely pace. At times the lush backgrounds and the static, two-dimensional cartoon characters seem at odds. Behind that visual tension, the movie’s shifting sympathies seem to move uncertainly between good and evil, peace and war. The film contains historical themes requiring mature interpretation, action sequences and a few disturbing images. The Catholic News Service classification is A-III — adults. The Motion Picture Association of America rating is PG-13 — parents strongly cautioned. Some material may be inappropriate for children under 13. McAleer is a guest reviewer for Catholic News Service.